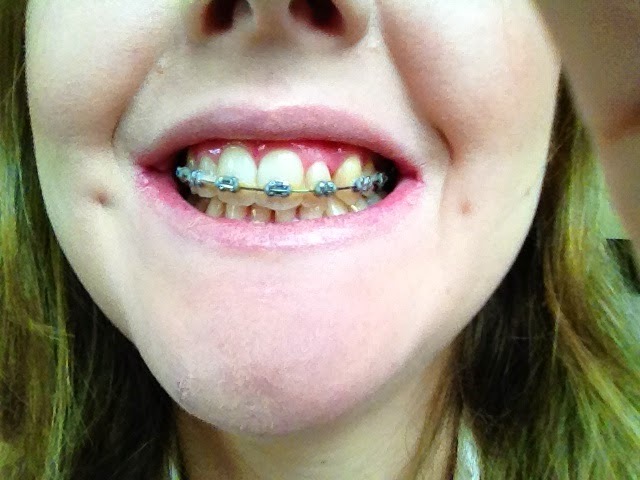 This post is actually incredibly overdue seeing as I had my braces removed September 2013! Saying that it has given me time (plenty) to reflect on my experience of wearing braces, having them off and how I feel about my teeth now. The models above are of my teeth pre treatment second time around, (I'll get to that). As you can see I had quite crowded teeth, with one of my front teeth crossing over the other and a narrow arch. As my front teeth are quite large, I was very conscious and aware of the fact one crossed over the other. It made me shy to smile and I would laugh with my hand over my mouth to try and hide my teeth. My teeth definitely had a large impact on my confidence and feeling self concious. As I say these models are from the second time around as I had braces when I was around 14, 15. Back then my teeth were severely overcrowded and I had to have teeth removed, surgery etc before I actually had my braces fitted. I was even more self conscious back then, being a teenager and shy at school. After all the pain and hassle of wearing braces the first time around, you'd think I would have been smarter and stuck to wearing my retainers but being young I naively thought they wouldn't move... Evidently they did! After my teeth moved, they didn't go back to as bad as they were but I was still ever so conscious of them and this took it's toll, never being happy to smile or laugh properly so I took the plunge and had braces fitted once again, this time at age 22! These are a few photos I took during my treatment. It took two years of wearing braces before my treatment ended and in that time I needed my centre line shifting round, as it wasn't matching up to the centre of my top lip (most evident in the first treatment photo). This required an implant to be placed in the bone in my upper jaw, with an elastic coming from it onto the brace which forced my teeth to move round. Having the implant fitted wasn't the nicest experience but once it was in, it didn't hurt and I hardly noticed it was there! When having my braces fitted the first time they felt very strange. Bulky, sore and rough are just some words I'd associate with having them put on but it's surprising how quickly you get used to it. By the end of the week they felt pretty much normal after the initial soreness and pain of having wires inflicting force on your teeth. Eating was a bit of a pain at first and I'd end up with food left in the braces but you soon train your tongue to fish out the debris and have a drink to help wash food away. I would always head to the bathroom after eating anyway just to check there wasn't anything there and brush my teeth if I needed to. Each time I went for an adjustment of the wire my teeth would feel sore and almost bruised after the appointment a few hours later but with the help of ibuprofen and a soft diet for my dinner that night, I coped pretty well and got used to it over time. 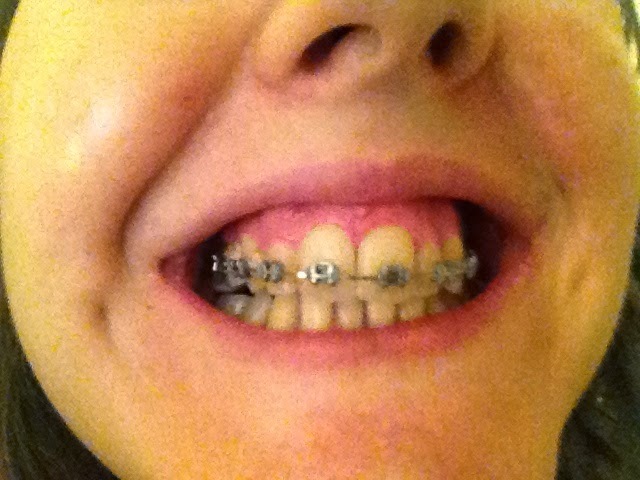 Having adjustments never left my teeth feeling as painful as they felt a few hours after having my braces first fitted. When I say painful I mean tender, throbbing and sore- a bit like what I imagine teething to feel like? It was never anything like a sharp pain and by the next day it was no more than a dull ache and I could chew food normally again. After two years I was so used to wearing them, they felt a part of me. When I met people they would admittedly look at my braces but after that initial greeting I never found people to stare at them which is what made me anxious about having them put back on in the first place. I even had boyfriends through my treatment which looking back sounds silly but I was convinced no one would be interested in a 22 year old with braces. Regardless I was happy to be single if need be in order to get lovely looking teeth and I weirdly felt more confident wearing the braces than I did with my teeth before they were put on. 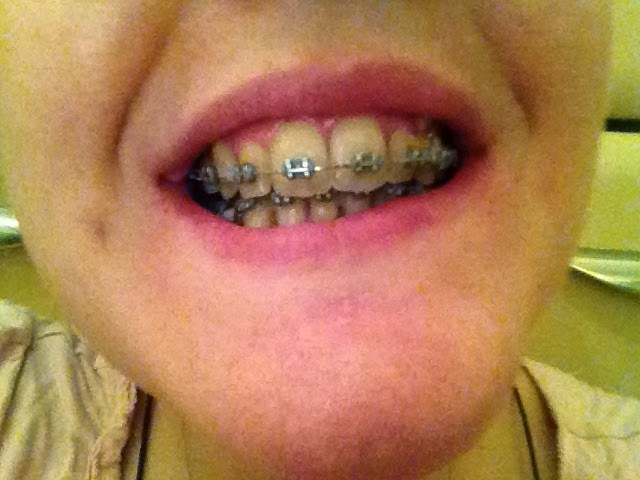 The day finally came for me to have them off and although it sounds weird, I was a tiny bit sad to see them go! I'd grown rather attached to them, especially as they appeared to make me look younger! I got I.D'ed all the time haha! Having them off was in my opinion worse than having them put on as they had to remove all the glue with a hand piece which made me cringe. The sensation put my hairs on end and I can only describe it as nails on a black board and your teeth are the blackboard but I was so excited to see my teeth "naked" it didn't matter so much. I was SO pleased with the result once the braces were off but christ did my teeth feel thin! After having so much bulky metal in your gob for two years my teeth felt paper thin. Luckily I had retainers to wear which made my teeth feel more secure and I had to wear them full time other than when I was eating and cleaning my teeth for 4 weeks after. I then got to wear them 12 hours a day for a few weeks, then 8 hours which I'm still doing now but come September 2014 I can wear my lower retainer every other night which will be nice! Despite wearing my upper retainer religiously, my two front teeth were very persistent during the day with trying to move across each other again... I went back to my orthodontist who attached a small piece of wire across the back of my two front teeth so that they physically can't move. Since having that put on in June 2014 they haven't moved and I'm so pleased! I still have to wear my upper retainer every night until my review appointment in December 2014 but its so worth it. I honestly cannot stress just how important it is to wear your retainer unless you are prepared for your teeth to move and all the hard work of wearing a brace be undone. I will never make that mistake again and I'm quite prepared to wear retainers the rest of my life! As you can see I can smile with confidence now and I LOVE smiling in photos with my friends and family now! Granted in outfit posts I'm a pouty madam but that's really for effect. In my day to day life I am a happy smiling 25 year old with a lot more confidence than I started out with. You can even see the difference in my two YouTube Videos I did on braces below! Having orthodontic treatment really changed my life in the sense of being happier in my own skin and giving me more confidence, not to mention the fact my teeth look so much nicer. For that, my treatment was 100% worth it and I would strongly recommend it to anyone else who has felt the same about their teeth as I do. Have you had braces? What was your experience? Recounting your journey with braces, I'm impressed that you adjusted to it pretty quickly. I'm also surprised by the fact that you were quite sad to have them removed. While you probably won't describe it as "pleasant" in its entirety, this should be better than most people's experiences, who were relieved with their removal. Your time with braces can serve as a fine example for anyone who's thinking of getting one. Thank you for sharing this with us! I had the moulds made through my orthodontist. I'm sure if you requested a set they would be happy to make you some. Giving ample time to think and reflect after a life-changing event has transpired is definitely a good thing to do. It enables a person to thoroughly reflect and think what made her do the change, and if it is worth doing. In your case, it was definitely worth it! All the money and time spent, all those food that you could not eat, those are what makes up the pretty smile that you have now, and you deserve to smile and be happy all the time. Anyway, I love the photos with the braces, and the one without them even more. Good day! Thank you for such lovely words. I'm almost two years without my braces now and I can honestly say they were one of the best decisions I ever made. It's amazing what a difference and what confidence a smile can give you!